Oh. My. Goodness!! I about swooned when I smelled this candle. It was solid bakery and the most delicious one at that. But, before I get into the fragrance itself, I need to tell you a bit about Candleberry’s new Unearthed luxury line of candles. Yes, they have branched into the world of luxury and so far, they’re doing a pretty good job. I’ve already reviewed an Unearthed candle called Augustus – review here, if you’re interested in reading it. And now Confectio which is already blowing me away. The candle itself is a large apothecary style jar with a gorgeous bronze lid that fits snugly on the candle. The label is an elegant vintage white with their logo, scent name and a short description of this delicious fragrance. Masterfully paired jewels of decadence, vanilla cream, candied pecans, royal maple and brown sugar. YUM!! And when you put your nose up to the wax, you’ll exclaim that word out loud. I could smell it all. The creamy vanilla with the perfect touch of candied pecans and brown sugar. The maple was light but who knows how strong that note will be once this candle is burning. I am so excited!!!! I went bold and lit this candle in my master bedroom to start out and I’m happy to report, Confectio held its own perfectly in a large room. The scent throw was out-of-this-world!! Once the wick was lit, the aroma was moving around the candle within a minute or so. An hour later, my entire bedroom, open bathroom and even beyond was saturated with the aroma of vanilla, candied pecans and brown sugar. It was super rich and dense, like a French pastry pulled directly from the oven, with lots and lots of candied pecans. I don’t know how else to describe this one to you. Basically, you’ll be tempted to eat this one. It smelled that delicious. Strength – I would rate Confectio a 10 out of 10 in any size room. This candle is a room filler. I absolutely LOVED it!! How did my Confection candle burn? This candle burned great. It was very slow burning and lasted a long time. I did have to keep up with wick trimming but that’s pretty normal with most candles. Confectio was a very rich and delicious bakery scent I enjoyed till the last drop of wax. If I had to describe it with one word, it would be – sinful! This fragrance was decadent and sinful. Just imagine roasted candied pecans with brown sugar and butter swirled into a creamy base of rich vanilla cream. Mmmm!! Can you smell it? 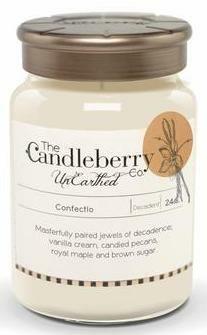 Definitely check out Unearthed from Candleberry next time you’re in the mood for something a little more luxurious. And if you love foody aromas, Confectio is a bakery lovers dream.